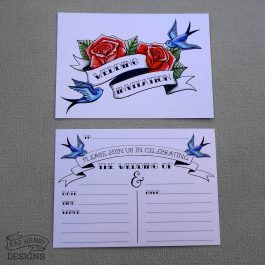 Tattoo wedding invitations perfect for a rockabilly or tattoo themed wedding. With a red roses and blue swallows design. 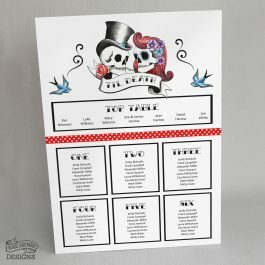 These invitations are write-your-own style with space for you to fill out your details. Sold in packs of 10, the invitations are A6 size, with double sided print, and come with white envelopes included. 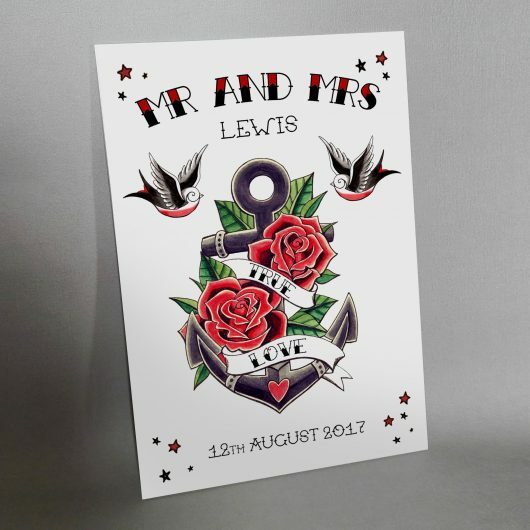 Tattoo Heart Place Cards/ name cards for the rock n roll Bride and Groom. 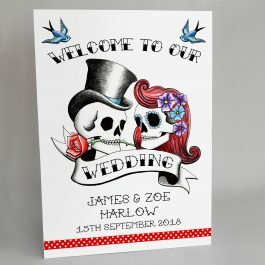 This unique design will add the wow factor to your top table for an amazing rockabilly or tattoo themed wedding. 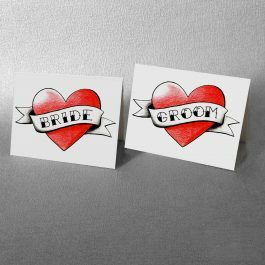 Each place card measures approx 9cm x 7cm with a single sided red tattoo heart design, with ‘Bride’ and ‘Groom’ printed in a tattoo style font in the banner.